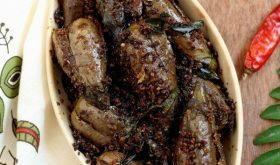 Gutti Vankaya Kura or Stuffed Eggplant/Brinjal curry is Andhra traditional special curry.This dish can be made with either the small purple brinjals or the small round green eggplants. But you need to make sure that the brinjals are absolutely fresh, shiny and tender (the seeds should’nt be black) without a dry withered look. 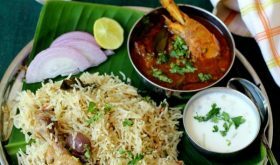 This dish tastes good only if the brinjals are fresh, young and tender. The one I am posting today is made with the small purple ones. 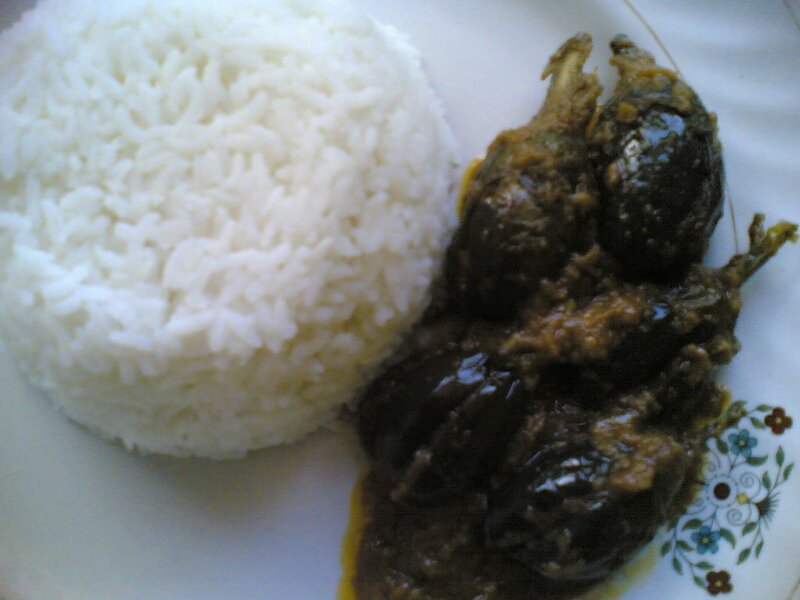 Well stuffed brinjal curry can be made with a variety of stuffings. The one I am posting today is a family favorite and very simple to make. If the brinjals are tender you don’t need to use a pressure cooker. The brinjals will cook well on steam in a cooking vessel, if tender. Wash and dry the purple brinjals. Keep the stalks. Heat 1/2 tbsp oil in a pan and add the garlic cloves and onions and fry on medium heat for 7-8 minutes or till transparent. Remove from fire and cool. Grind to a paste adding little water. Add the coriander pwd, cumin pwd, chilli pwd, butter or ghee, sugar or jaggery and salt. Mix well. Separate the brinjal quarters gently and fill the stuffing inside slowly without breaking the brinjals. Stuff all the brinjals in this manner. Keep aside the remaining paste. Heat 1 1/2 tbsp oil in a cooking dish. Add cumin seeds and let them splutter. Add the methi seeds and curry leaves and fry for few seconds. Now slowly place each of the stuffed brinjals in the dish and add the remaining paste on top and sprinkle 1/4 cup of water. and cook for 20-30 minutes on slow heat. Do check in between to stir the brinjals without breaking them. 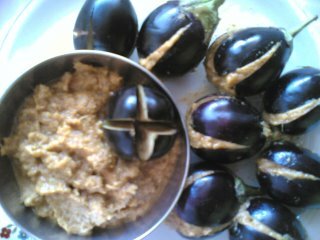 the brinjals are three fourth cooked add the tamarind paste and one cup water. Adjust salt. Cover and cook further for another 25-30 minutes or till the brinjals are well cooked and soft on touch. Garnish with chopped coriander leaves. To serve, gently lift the stuffed brinjals with a wide spoon and place on serving plate and pour the gravy. Tastes wonderful with hot rice or roti. 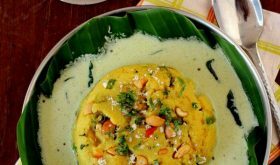 Sailu, you've just made me plan my menu for tomorrow–love this Andhra dish , Thanks for the recipe! I bumped into your recipe while aggressively searching the net for an authentic guthi vankaya recipe. This recipe sounds awesome, am gonna try to make it this weekend. Kudos for an original post…finally i have bumped into something thats not the same as bhagara baingan! Your recipes for Royyala Iguru, Gutthi Vankaya Koora and infact all your recipes make us homesick! Thank you for sharing, I bookmarked your blog and look forward to more recipes we can try out! Shekar garu,I am glad my recipes remind you of sweet home.Thanks for book marking my blog and hope to post more authentic andhra food. Hi Sailu, Is gutti vankaya koora same as bagara baigan? i.e., same recipe? if not, would you recommend any good places I can find it? No,Ram, gutti vankaya kura isnt the same as bagara baingan. Its a North Indian dish and you can find a recipe for it at Mahanandi’s blog. Hi sailu is gutti vankaya kura same as vankaya menthi karam? i have tried your gutti vankaya curry. today is 1st june 2006 and it is 6:07 pm here in philadelphia. i have finished making the curry with your instructions. it has come out very well and it tastes very good. i have added your site to my favourites and i am thinking of trying other recipies also. the way you give the instructions is very good i love to make when i have proper instrutions and also pictures of the item. I am so glad to hear that it came out well and you like the recipe presentation, Latha. I tried this type of gutti vankaya which is different from my mother’s gutti vankaya recipe. It came out very well and please keep us posted with nice recipes. First of all, I wish to let you know that this is one of my favorite cooking blogs – I like the presentation of items including the font and pictures. It’s realistic and a pleasure to read. Thank You for a great site!! 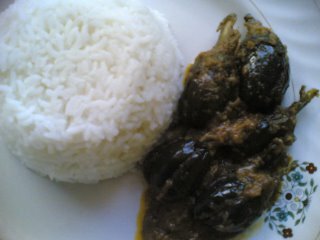 Secondly, I have become very fond of eggplant (or brinjals, as we call it back home) recently. I used to hate it while growing up!I keep browsing for different variants and am glad to have found this one. I make a different version using ground raw onions, tomato, garlic, ginger, coriander, green and red chillies and mixing the same with vangibath powder (My Mom’s recipe that I make from scratch). 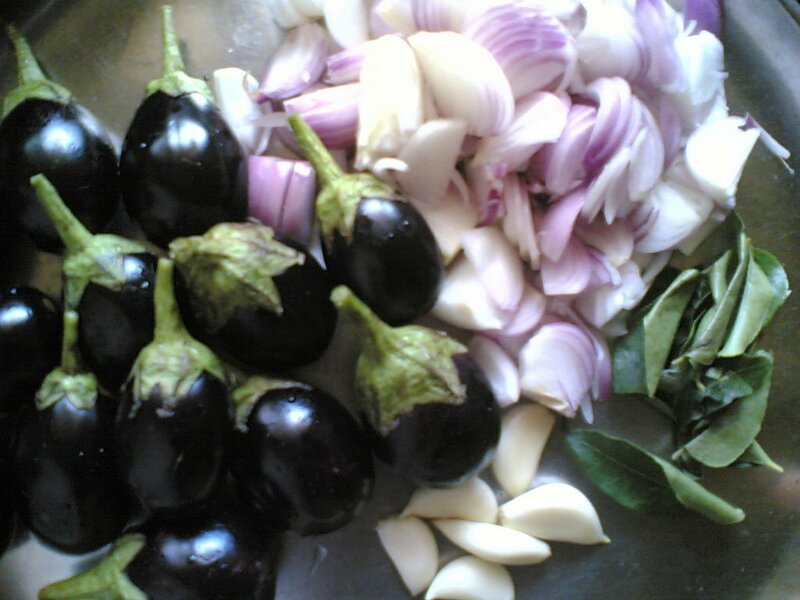 This mixture is then stuffed into these small purple brinjals as you described and cooked until brown and well done. The final product resembles yours and tonight I’ll try the same substituting with your spice mixes. Will keep you posted on how things turn out. Thanks again and keep those tantilizing recipes coming! i’ve tried some of your curries ..they are awesome,thanks for sharing.. Bingo!! This was one of the dishes which I saw on the net came out really well. I was missing my mother’s dish but after preparing this dish I really felt that I was having this dish in my home. Thanks a lot for a wonderful recipe. Please keep me posted. Glad to hear that, Satish..:). Thank you very much for sharing this gutti vankaya curry(onion paste stuffing). I have tried many such other stuffed curries, but this was the best. I was very happy as my husband has liked it the most. I would like to suggest a variation for this. We can try up the same curry with Beerakaya and Dhondakaya(has to be boiled separately) which can be add in the onion paste along with tarmarind and sugar and are to be boiled for 15 to 20 minutes. The same curry can also be done with potatos and raw bananas. Potatos have to be boiled separately. Raw Bananas have to be boiled in tarmarind pulp. Then they have to be added up in the onion paste and are to be boiled in the onion paste for some 15 minutes. I just thought of sharing these variations so that others can try out something new. First time gutti vankaya koora cheddamani online lo search chesanu me site lo cahdivi ninna chesanu. Awesome ga vacchindhi (naku nenu cheppukovadam lendhi nijanga tinna ma friends andharu bagundhi annaru, recipe evariccharu ani adigite mee peru cheppa). Thank you verymuch for the wonderful recipe. Ma amma indhuloki koddiga peanut powder kooda vesedhi alage try chesanu. Thank you verymuch for posting such a nice recipe. The cool part is u made it simple enough even for guys like us. I like your blog. Must say i have tried your stuffed brinjal and tindora. Loved it. Looking foward to more of your recipes. Your style of presentation is very precise . Thank you sailu garu for all your recipes, maa ammamma kooda Gudivada deggara Guraza aney oori nunchi… mee recipes choosina, sitelo bommalu choosina, vandaka taste choosina, it feels so very at home… pellayaka US vacchesa, so naaku friend, amma, akka, chelli, everything in terms of cooking is you.. nenu edi chesina, adi baga kudirindantey just because of you… the pics you use just make my day and make me want to cook. Your description is very clear. I willgive it a try soon ! great.really i remembered my mothers recipe way back in the gulf.i can rely on this again and agian. Hi Sailu, First I want to tell you that your website is awesome. I tried this recipe today. I have eaten this curry at different south indian restaurants and I wanted to try to make it myself. I made it and it turned out ok….a little bit on the sour side (pullaga). I was wondering if the tamarind paste was necessary. Before I added the tamarind, it tasted excellent but after the tamarind I wasn’t satisfied. I guess I will try it next time without tamarind. Thanks a lot for the recipe though. I love your other recipes as well. Im very glad that u r from Vizag.I miss Vizag. your recipe for vankaya koora is simply superb. i have tried it personally and it was a grt hit………. thanks for ur lovely description. Amazingly simple description.. Im gonna do it for first time today… Helps a lot to bachelors like us…. Keep posting. I have tried your Gutti vankaaya recipe and it came out very well, and we enjoyed it. I am happy with your recipes unless like others. The OTHERS give a big narration before the recipe, like how they come across the recipe, or their mother – in-law liked it or while they got this recipe while f*** the husband etc. To everyone: PLEASE KEEP THE PERSONAL NARRATION DOWN AND SHOW/TELL US THE RECIPE. We don’t want to hear or know about your personal life… like …. my son liked it or my Husband liked etc…because everyone has a life just like yours. If you do not tell about personal details and continue with explaining the recipe only… EVERYBODY WILL LIKE IT. Nee Bondha! If there is a personal sentiment associated with a recipe that someone is posting, what is wrong with that?? Sounds like you are the problem. Many of us do like the personal narration that comes with the recipe. You have a choice to not read if you don’t like the way it is written. It is not like they are posting recipes for people like YOU. Don’t like it. don’t read it. Go elsewhere. It is as SIMPLE as that. hi sailu garu, nice recipe. gud taste. This gravy turns out well each time!Thanks. The recipe is awesome.. it reminds me of the food made by my mom. Thanks for the recipe. Dear sis, v r frm kerala, living in UAE. my husband was in Andhra for long time. he loves Andhra dishes. 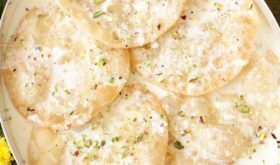 i ws searching for such recipes. i tried this recipe and it came out very well. i too really liked it. thank you dear…and i’ll try more andhra recipes in future. hi sailu, i made this curry for our gettogether….evrybody liked it…thank you soooooo much…. Thank you Sailu, It is easy and simple. I heard that cocnut paste, peanuts and pupy seeds would add more flavour to the curry. Is it correct? Great post! I love these. very nice recipe. Thanks for posting it. Hi Sailu.. Doesn’t it contain roasted peanuts.. ? What is the recipe for the similar brinjals using roasted peanuts for stuffing.. ? And I love love love your blog.. The photos, the recipes, the descriptions, everything about it.. Very easy to follow. Peanuts are not required for this recipe. Hyderabadi style Bagara Baingan calls for the use of peanuts. l had tried and its taste is awsome……. thanks for sailus kitchen….. p.s.n.reddy. Hi there, I love your blog, I’ve tried out quite a few recipes. This recipe was good, but not finger-lickin’ good. I found another one which calls for almost no onion, but for urad dal, chana dal, red chillies, peanuts, coriander seeds, two teaspoons grated coconut, and haldi power (to be roasted and ground into a paste, with a few other things.) This was pretty awesome. The coriander seeds and the coconut lend amazing flavor to this dish. Your recipe is just fine, but needs to be tweaked for flavor. Super simple yet damn tasty. Before I got your recipe, I never got the brinjals perfectly cooked. 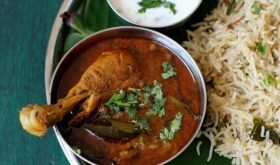 I owe a lot to this site… Simply love your recipe s Sailu Garu. I owe a lot to you Sailu garu. Your Andhra style food is my inspiration to learn more about Indian cooking. You are like my cooking Goddess. Have you published a book? If you didn’t, you really should. I love the presentations and explanations. Simply lucid. For any Indian dish, my google search would start with ‘Sailu’s (name of dish)’. May the force be with you, forever and always. Much love from California.